Today, France celebrates it’s national independence day, the anniversary of the 1789 storming of the Bastille prison in Paris that marked the start of the French Revolution. The City of Light observed the holiday with a massive military parade from 9 a.m. to noon (midnight-3 a.m. here in SoCal) along the Champs-Elysees and with fireworks at 11 p.m. (2 p.m. SoCal) over the Eiffel Tower, as well as through numerous other city-sponsored and private events held throughout the region. 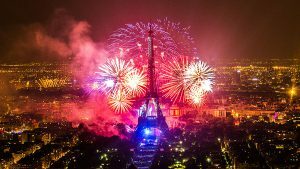 Francophiles, you can watch the Parisian fireworks online at http://quefaire.paris.fr/14juillet. And if you happen to be in Paris today (lucky you!) show up early to snag a spot on the Champs de Mars park adjacent to the Eiffel Tower for an unparalleled view of the fireworks show. Many of the city’s bridges also are ideal viewing locations, particularly the Pont de l’Alma, Passerelle Debilly, Pont d’Iena and Pont de Bir-Hakeim. And just a quick note: The French do not call the holiday “Bastille Day;” that’s an English-language construct. 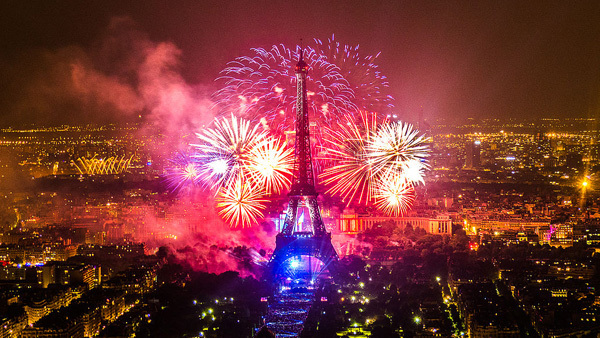 It is referred to as “Le 14 Juillet (The 14th of July),” much in the same way Americans call Independence Day the Fourth of July, or “Fete Nationale.” So, if you want to wish Parisians a happy holiday, a simple “bonne fete” will do. Liberte! Egalite! Fraternite! This entry was posted in French holidays and tagged Bastille Day, Champs Elysees, Eiffel Tower by Bob Adams. Bookmark the permalink.